I'm very cool. i never blow my own trumpet. i like purple. More trees more ponds.I'm a sensitive soul. Hey bloggers, hope your all really well. Rene and I are doing great, our little baby in Rene's belly is super healthy and now only two months from arrival. Rene is blooming, and doing all the right things, she is brilliant and beautiful. I have been working on two new song's at the moment. One is about my sister L'rain, my only sister I haven't written a song about already, so I think she's glad about that, and the other is about my present predicament, and it's called 'Whole'. It is a lovely song, but still needs some work. Great news, my CD INVISIBLE has been repressed and is back up on the eelpie site for sale, the link is on this page, please spread the word, it's been sold out for so long, I need some help to get things back up to speed, I would truly appreciate any help given, thanks bloggers. It is great to know that you guy's are still out there, thanks for all the shouts here. Take care and Give me a shout, please. I hope everyone had a great Christmas, thankyou for all the great shout's here. I have been very busy, but hope to get back in the swing of things before too long. Everything is going very well, Rene is well, the new house is slowly transforming and I am writing music. I've played a few small gig's lately, but am going to try and play more than ever this year. They have gone well, and it's been good for me to perform hour show's, I'm finding some older material of mine that seems to work well now. Well this is just a shout out to say I will continue this blog, sorry for the slack blogging. 2008 is going to be a good year. Hope you are doing good, please let me know if you are still about? I think I mean, GMaS (give me a shout). Thanks for all the shouts here, I know I haven't blogged much lately, but I have been very busy. I have completed most of the renovations around the house, and we have a moving date, which is at the end of the week. So packing is in full effect. Once we've settled in the new house, I'll blog again and give you all the latest. Sorry to everyone who tuned into the radio show, that was the recording, but I wasn't sure at the time whether it was live or not. 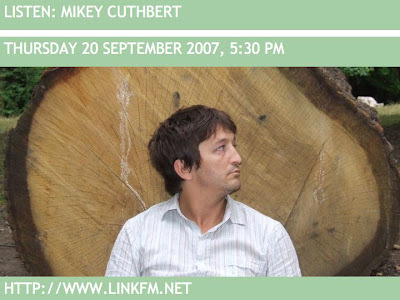 You can hear me perform and speak candidly about my musical journey, I also give away a little secret, so tune in, the 'folk accoustic and blues' show on Link fm ( www.linkfm.net ) on wednesday 26th September from 7 to 9pm UK time. I think there is another musican in the first hour, but I'm not sure how it's going to work. Please try and tune in if you can. 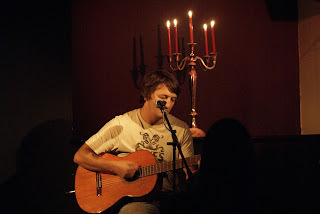 I played a gig at the Grey Goose (formerly the Smoke Rooms) on Sunday evening, and had a brilliant time. The other act's were good, I opened and played five songs, Plasticine, We will fix it, Sound as a pound, Greenhouse and Misery. The crowd responded to me well, and I feel I played well. The gig last week went really well, many thanks to all who attended and all who wished me well. I played four songs, starting with Plasticine, then Tourist, Misery and then Greenhouse, my new one. They all went down really well, and Rene said that she really enjoyed Greenhouse, it's hard playing new stuff, although I really enjoyed performing it. Friends and family attended, but me and Rene left shortly after my slot. There were three other acts performing, which I heard briefly during the sound check, and all sounded brilliant, but it was already late and we were both tired. Many thanks to Mark T, who took this picture. Thankyou to everyone who wished me a happy birthday, I am 35. I spent my birthday on Southend pier fishing, Rene came too, and we had a lovely packed lunch of whole lobsters and potato salad, washed down with a flask of tea, it was the best, I caught a few fish as well. I got loads of lovely presents and bought myself a guitar, it's a sixties Yamaha G-180 A, if that mean's anything to anyone, I'd love to get some feedback from the great blogger knowledge out there. It has a pick up already fitted, and sounds lovely, I decided to use it for the gig, because it's so much lighter than my JS 200, and the perfect sound for Greenhouse. Hey bloggers, sorry for my absence. I've tried a thousand times to sit and write something here, but couldn't manage it, don't know why. Firstly, I would like to send out all my love to Suesjoy, and wish her a speedy recovery, she is a lovely women that I had the fortune to meet in LA last year whilst attending one of Rachel's B&N gig's. So get well soon Sue. On a completely different note, far less important, I really miss ITA, and when I found out from Rachel that the show was ending, back at the begining of June, I was very upset, I thought it was my fault, but these things happen and I must move on. My newest song GREENHOUSE is complete, and I hope to record it soon. 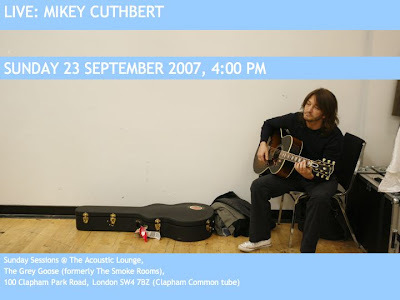 I have a gig on the 1st August in Clapham, please check out my myspace for detail's, or the ITA site. There are a few things in the pipe line and I shall do my best to keep you informed. My life has been very busy lately, Rene and I have bought a new house, and I am renovating our flat at the moment. I am not a builder but have grown up surrounded by them, my father can do absolutely everything, my brother is a great carpenter and all round clever fella, uncle's were electricians, friends are brick layers and so on. I come from a working class family, so it was hard for them to understand my career choice of artist and writer. Although, having my family and friends has helped a great deal. All is fine in my world, sorry again for the slack blogging, I'm constantly checking my pages, but have felt quite remote, I hope you can understand. Hope to see some of you guy's at the gig, and I'm sure I'll feel the rest of you, thank's for all your support. Once again, my heart goes out to Sue, brave girl, be strong. Hope all you bloggers are ok, take care. Thanks for all the great shouts here, I had a great time on Tuesday's In The Attic, it was just like old times. I'm glad to hear some of you liked my new song Greenhouse, and since the show I've been inspired to write more, getting close now. Was on the train at 7 this morning which is pretty early for me, but looking forward to a great show today from Southampton Rosebowl - Please tune in, we're on at 5pm In The Attic. Anyway, will blog again soon with today's stories. Hope everyone in blogland is good.